LIVE CRESTED BUTTE Shops & Gyms to Get You Prepared! THE ADAPTIVE SPORTS CENTER How they’re changing the adventure world. This material is based upon information which we consider reliable, but because it has been supplied by third parties, we cannot represent that it is accurate or complete, and it should not be relied upon as such. This offering is subject to errors, omissions and changes including price or withdrawal without notice. Photos for land and condos may not be of the actual lot or unit and may just be a representation of the subdivision or condo complex. Published November 2018. ©MMVII Sotheby’s International Realty Affiliates LLC. All Rights Reserved. Sotheby’s International Realty® is a licensed trademark of Sotheby’s International Realty Affiliates LLC. An Equal Opportunity Company. Equal Housing Opportunity. Each Office is Independently Owned and Operated. Crested Butte Sotheby’s International Realty OFFERS AN ADVANTAGE... A Powerful Partnership In 2018, Crested Butte Sotheby’s International Realty was As Regents, we are armed with an array of powerful, selected as the exclusive Board of Regents member for exclusive marketing tools and solutions which allow us to Who’s Who in Luxury Real Estate in the Crested Butte and showcase our listings to targeted, elite buyers worldwide. Gunnison Valley region of Colorado. Who’s Who in Luxury The digital footprint for Regents is unparalleled, with prime Real Estate is globally recognized as the most elite and placement for every agent and listing on the #1 rated real comprehensive luxury real estate network in the world, estate website LuxuryRealEstate.com, as well as privileged and the Board of Regents is comprised of the leading inclusion on Regents.com. authorities in each market. Adam was born just outside the city of Poughkeepsie amidst the rural surroundings of upstate New York. From a very early age he showed a strong interest in drawing and painting and pursued these interests throughout his schooling, graduating from Buffalo State College with a Bachelor of Science degree in Art Education. He taught elementary school art for three years before deciding to pack up and travel across the European continent, eventually trekking through thirteen different countries documenting his experiences in sketchbooks using drawings, collages and the written word. When Adam returned to the states, he began to focus more intently on his own personal art production. During this period, he headed west and discovered a love for the Colorado Rocky Mountains. Adam quickly settled into a life of skiing, mountain biking, hiking and of course, painting. Adam Freed currently resides in the small ski resort town of Crested Butte, Colorado with his wife and two sons where he paints full time from his home studio. Variable is the word that comes to mind when describing the real estate market in Gunnison County as we look at our 2018 statistics. This has been expected with the acquisition of Crested Butte Mountain Resort by Vail Resorts, and we foresee change to continue in the next year. Certain categories, such as vacant land, have seen a dramatic boost in sales this year. More 35+ acre parcels have sold in 2018 than any year in the past decade. Vacant land inventory is the highest we have seen in the past 10 years; therefore, land prices have not rebounded to the highs of 2007. Rural Crested Butte and Crested Butte South saw the largest increase in sales compared to last year, so the building movement is not likely to slow down anytime soon. Residential inventory on the other hand is down compared to last year, resulting in less sales. The average sold price for Gunnison County also dipped from 2017. Specifically, Rural Crested Butte experienced the largest decline in residential sales, with total properties sold thus far down 36% and sales volume down 37%. 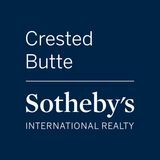 Contrarily, Crested Butte South saw a 19% spike in residential sales volume and a significant increase in average sales price â&#x20AC;&#x201C; the highest CB South has seen in the last ten years! With new resort ownership this year, the real estate market is expected to grow, and with new developments underway, we expect the next year to be very exciting here in Crested Butte! Impacting Lives Through Adventure By: Brian Barker Next time you visit the base area at Crested Butte Mountain Resort, you’ll probably walk past a big new building sitting just past the Mountaineer Square tunnel. The four-story, 25,000 square foot facility is the Adaptive Sports Center’s new Kelsey Wright Building, and it’s a very big deal for this quickly-growing non-profit. The Adaptive Sports Center (ASC) is a year-round program that takes people with disabilities on outdoor adventures, with the goal of helping each participant push their boundaries and live fuller, richer lives when they return home. The ASC provided more than 15,000 hours of therapeutic recreational programming last year to people of all abilities and ages. The organization’s professional instructors offer skiing, snowboarding, snow-shoeing, ice climbing, rock climbing, mountain biking, kayaking, stand-up paddle-boarding, hiking, and more. While the ASC works closely with individual participants and their families from around the world, it also partners with nationally-known rehabilitation hospitals to bring in groups of participants and plan week-long adventures for them. The ASC provides everything from ground-transportation to lodging and meals for the groups, in addition to planning and guiding their activities. Recent groups have included participants from Craig Hospital, the DC Firefighters Burn Foundation, the International Neurorehabilitation Institute, Texas Scottish Rite Hospital for Children, Walter Reed National Military Medical Center, and many others. In recent years, the ASC has had to turn away groups of participants because it lacked the space to serve them. Because of this, the organization has been raising funds to construct the new building. So far, they’ve raised more than $13 million for the project. a significant contribution from President Jimmy Carter and First Lady Rosalynn Carter. Today, the ASC provides more than 6,000 activities per year to nearly 800 individuals who come to Crested Butte from all over the U.S. and overseas. Interested in getting involved? The Adaptive Sports Center uses a team of volunteers to assist its professional instructors with both winter and summer activities. To volunteer, visit adaptivesports.org or call 970.349.2296. Some of the building features include a larger participant assessment space, an equipment modification and fit-up area, direct access to base area lifts, indoor climbing wall, accessible participant housing, meeting areas and administrative offices. It will also feature a basement for locker rentals. 1482 Peanut Lake Road PEANUT LAKE A unique parcel offering the outstanding opportunity to build your lakefront dream home in paradise. This parcel is abundant with wildlife and waterfowl, yet sits just a mile from Crested Butte. Access to several of the countyâ&#x20AC;&#x2122;s finest hiking, biking, and Nordic trails is just a step away. Gaze over Peanut Lake and enjoy views that include Mount Crested Butte, Gothic Mountain, Whetstone and the charming town of Crested Butte to the south. Turn north to the majesty of Paradise Divide. Surrounded by protected lands, generations of your family will be able to enjoy these unparalleled views! Boasting 57 acres, this parcel is one of the largest of Trappers Crossing and includes partial ownership of Peanut Lake. Two of the allowed four buildings have been built, the Guest House and the Barn. The Guest House is a beautiful 2 bedroom plus / 2.5 bath, with a garage and broad exterior decks overlooking Peanut Lake. The Barn contains ample room for a large workshop, second floor storage, and four outdoor bays. This is a true legacy property that must be seen in person to appreciate the breadth of the views and the beauty of the terrain. 1515 Red Mountain Ranch Road RED MOUNTAIN RANCH One of the most exciting and beautiful homes in the Crested Butte area. As you approach the home, the first thing one notices is the massive boulder formations giving the impression that the house is emerging from the mountain. This sets the stage for the magnificent entry to the great room of the home. Filled with beautiful furnishings, expansive windows, dining and bar area and a kitchen suitable for a chef. Additional spaces include a desk area and a butlers pantry. The family has their own side entry for shedding ski or hiking gear, enough space for skis, outdoor gear, and the laundry! Choose between a master bedroom on the main level or the second level master, both equally spectacular. The walk-out garden level adds a theater/billiards room, bar and an additional two bedrooms and baths. So many features from this construction of mainly reclaimed wood from a barn in southern Colorado. The lighting was designed with a Lite Touch system. Additionally there is an extensive security system, Central Vacuum, radiant in-floor heating and the roof is made of recycled tires with a 30-year transferable warranty. Supporting this amazing home is a three car garage with workshop and great dog washing station. One bay is oversized to accommodate an RV or possible boat. The water storage for fire suppression and landscaping is in it's own storage room within the garage. For someone looking for privacy and the finest attention to detail in a magnificent setting, this is a must see home. 781 County Road 4 PEANUT LAKE A unique residence with privacy and solitude that also has easy access to town. Situated on 36 acres, the property includes both banks of the Slate River for summer adventures and ski-in/ski-out Nordic trails in the winter. The home is only 1/2 mile to downtown Crested Butte. This classic, traditional style residence features a great, open entertaining kitchen living room with cathedral ceiling, natural rock wood-burning fireplace and 12â&#x20AC;&#x2122; tall windows providing unobstructed, protected views to the surrounding mountains and valleys, a light-filled sun room with south-facing views capturing the morning sunrise over Crested Butte Mountain. This premier property, in pristine condition, has a prized location with dedicated summer hiking trails at the property edge. An outstanding opportunity to reside in a beautiful home on generous river acreage with walkable access to the shops, restaurants, and arts facilities of charming, historic, Crested Butte. 1610 Red Mountain Ranch Road RED MOUNTAIN RANCH Arguably one of the most spectacular locations in the Upper East River Valley, the panoramic views, mature forest and meadows and privacy of this property will stop you in your tracks. Sitting on the western edge of Red Mountain Ranch, the home enjoys up front and stunning views of Whetstone, Mt. Crested Butte, the Paradise Divide and the Elk Mountains. One can literally see for miles from this amazing spot. Featuring an open and flowing floor plan anchored by amazing vaulted and beamed ceilings, the two-story ranch style home comprises 5,450 SF and four bedrooms. Two of the bedroom suites including the master sit on the homeâ&#x20AC;&#x2122;s main level. Two more bedroom suites and a spacious second living room are located on the lower level. Above the 755 SF garage is a finished bonus studio or 5th bedroom space. The parcel is just over 35 acres big providing unparalleled peace, quiet and seclusion. embrace the great room with seating for your entire family...children and grandchildren. An open gourmet kitchen features high-end appliances, custom cabinetry, and sandstone counter tops; perfect for the vacationing gourmet. A true gathering place for today's lifestyle. Other features include a study/loft area with a secret room for extra space. Trapper's Crossing at Wildcat offers miles and miles of open space for long walks and snow shoeing. A respite for the weary and solitude for the needy! One of a kind property just 1 mile from the city limits offered in the exclusive neighborhood of Trapper's Crossing at Crested Butte. Drive time might be 5 minutes or it's an easy walk or bike ride too! The guest home offers 2 luxurious bedrooms and open living/dining/ kitchen built with the highest quality finishes. The Barn has an additional apartment with 2 more bedrooms and bath. Use your barn for a shop, stable, garage or what suits your hobbies. Per the covenants there's plenty of room within the building envelope to build a major home should you have an interest in doing so. This is a very unique property with fabulous natural landscaping yet tremendous views. and trim, in-floor heat, cathedral ceilings, arched interior doorways, and a 3-car garage. High efficiency seam metal roof, exterior wall finishes of Oklahoma farmerâ&#x20AC;&#x2122;s blue natural stone, stucco and metal, dyed,stamped concrete entry porch and exterior timber truss construction. Includes a vaulted master bedroom, junior master bedroom and a large lower level family room. The Larkspur community provides a neighborhood of quality, distinctive homes, Larkspur Lake access, nearby National Forest trails in a neighborhood only 2 miles from Crested Butte with a dedicated pedestrian path to Town. wildflowers as well as the complete privacy afforded by a community designed with the priority of seclusion. This 35 acre ranch property is one of the few parcels on Red Mountain Ranch that directly border 6,900 acres of National Forest, extending your recreation opportunities for endless hiking, snowshoeing, horseback riding, and adventuring in your own backyard. An understated simplicity is complemented by interior features of 10-foot ceilings framed in crown molding, custom-milled trim, the golden hues of oak and gorgeous tile flooring, and designer light fixtures. It even includes an oversized 952 SF, three-stall garage for all your toys. stone and timber, donated stained glass, and more. The centerpiece of the room is a large mining storage tank that has been converted into a fireplace at the base and a shower with 360-degree views and sunroof on the second floor. Stone stairs lead to the second floor loft where there are two sleeping areas and second full bath complete with a claw foot tub. A side entrance off the second story leads to the rooftop, an absolutely unrivaled spot for spectacular, summer star gazing! From secluded mountain vistas to private lake access with fishing rights along with easy access to National Forest lands, this is a tranquil, one of a kind mountain home only 10 minutes from town. 496 White Buffalo Trail RED MOUNTAIN RANCH Driving a short way up Red Mountain to White Buffalo Trail brings you to a private winding driveway down to the home and views everyone asks for. The location affords views of the entire East River Valley, Paradise Divide, Crested Butte, Teocalli, and Castle. As you open the front door to a vaulted ceiling you immediately find a wonderful open floorplan designed for todays flexible lifestyles. The big deck around the house brings the outdoors to you. You'll have many open starry nights awaiting you far from society; and so peaceful and serene. 360 White Stallion Circle BUCKHORN RANCH Just completed by Journeys End Builders. This Buckhorn Ranch four bedroom home enjoys a primo perimeter location with forever protected views, solar gain and lots of space for the family. The property backs to permanent open space! Interior highlights include wide plank wood flooring with radiant heat throughout and stunning vaulted ceilings anchored by big, exposed wood trusses with eye-catching steel treatments. Exterior features include Montana Timber Products wood siding, Harris Stone rock treatments and corrugated metal aprons. 271 White Stallion Circle BUCKHORN RANCH Beautiful 4-bedroom luxury home faces south, enjoys beautiful mountain views, solar gain and big 3-car garage. The master suite enjoys vaulted ceilings and an attached double vanity bath with steam shower. Downstairs, there are two more bedrooms, a full bathroom with a double vanity and a big gear and laundry room off the 950 SF garage. Bathrooms feature natural stone tile, quartz and granite tops and Kohler fixtures. The 300 SF covered deck expertly captures the commanding views of Red Mountain and Whetstone Mountain and Red Lady. A beautiful four bedroom luxury home at Buckhorn Ranch! Interior highlights include wide plank wood flooring with radiant heat throughout the home and stunning vaulted ceilings anchored by big, exposed wood trusses with eye-catching steel treatments. Exterior features include Montana Timber Products wood siding, Harris Stone rock treatments and corrugated metal aprons and roof. The heated, three-car garage weighs in at a whopping 948 total SF. The 288 SF covered deck expertly captures the views to Red Mountain and Whetstone. Sweet location at Buckhorn Ranch facing south toward the mountain views! Highlights include commanding vaulted ceilings anchored by big wood trusses with cool steel treatments and wide plank wood flooring with radiant heat throughout. Exterior features include gorgeous wood siding, a covered porch, eye catching down lighting, Harris Stone rock treatments and corrugated metal aprons and roof. The heated, two-car garage is 688 total SF. The 300 SF covered deck expertly captures the commanding views of the surrounding mountains. This newly built home enjoys wide plank wood flooring with radiant heat throughout and stunning vaulted ceilings anchored by exposed wood trusses. The master bath features a steam shower. Downstairs, there are two more bedrooms, a full bath with double vanities, and a gear and laundry room off the 2-car heated garage. The kitchen is outfitted in gorgeous, solid granite tops, ProCraft cabinetry, Jenn-aire stainless steel appliances including a 36-inch, six-burner duel fuel range and hood. The baths feature natural stone tile, quartz tops and Kohler fixtures. 87 Coyote Circle SKYLAND Spacious duplex townhouse situated on a large, 1-acre tract with great views to Paradise Divide, Whetstone Mountain and the entire Elk Mountain horizon. This townhouse has a beautiful interior with many comfort features including vaulted, timber truss living room with rock fireplace and generous 12' hearth, hickory hardwood floors, granite and stainless kitchen and knotty alder cabinetry, trim and mill-work with bronze hardware and locally forged ironwork, large master suite with oversize Jacuzzi tub, and an oversize, heated, 2-car garage. 42 Stream View MERIDIAN LAKE MEADOWS Incredible location in Meridian Lake Meadows for recreationalists and people who love the great outdoors, yet only 8 minutes to Crested Butte or to the ski slopes of Crested Butte Mountain Resort! After a long day on the slopes or on the high elevation trails, thaw out in a brand new outdoor 8-person full body massage hot tub. This lovely custom log home features an open floor plan, vaulted log beamed ceilings throughout and stunning exterior logs. Extensive hardwood and tile flooring and two en suite bedrooms. The kitchen features granite countertops, tile flooring and backsplash, and a stunning view of Mt Crested Butte from the kitchen sink. Balconies and several decks maximize outdoor living with the alpenglow on Mt Crested Butte and unobstructed views of Washington Gulch and many surrounding peaks. An oversized 2-car garage and a one bedroom apartment with a private entrance round out this intriguing mountain home offering. BUCKHORN RANCH Buckhorn Ranch is a private community located about 5 minutes from downtown Crested Butte Colorado and less than a mile from the Crested Butte Country Club. Featuring 360 degree views of the surrounding mountains and Upper East River valley, Buckhorn Ranch owners enjoy quick and easy access to Crested Butteâ&#x20AC;&#x2122;s legendary National Forest Service biking and hiking trails, rivers and snow skiing. Multi-family lots available as well starting at $348K! The Reserve on the East River. Lot 8 is an absolutely incredible home site opportunity at the coveted Silver Sage community in Crested Butte. The location borders 6 acres of private and protected open space, the Slate River and the back nine of the Crested Butte Country Club. The setting and the panoramic views from this location are stunning. The Paradise Divide, Mt. Emmons, Mt Crested Butte, Axtell and Whetstone Mountains fill the skyline in every direction. The private fishing, boating and bird sanctuary on the Slate River is out the back door. SKYLAND Skyland Neighborhood is located 2 miles south of the town of Crested Butte. This luxurious subdivision surrounds the Robert Trent Jones Championship Golf Course at the Club at Crested Butte. Amenities include the Clubhouse with restaurant, bar, and fitness center, Grant Lake access, Slate River fishing, as well as nearby hiking and biking trails. TBD Marmot Way TRAPPERS CROSSING AT WILDCAT Be a part of Crested Butte, Coloradoâ&#x20AC;&#x2122;s distinguished subdivision, Trapperâ&#x20AC;&#x2122;s Crossing at Wildcat. Comprising of 40.81 acres directly adjoining 1000s of acres of public lands, this lot features year-round access, electricity and two water wells on site. Breathtaking views makes this one of the most desirable building sites to build your dream home for your family gathering place this year and for many years to come. GLACIER LILY ESTATES Glacier Lily Estates is conveniently located between the town of Mt. Crested Butte and the town of Crested Butte, and offers some of the best views in the valley! Lot 16 is situated near the northern boundary of the community, adjacent to the pond and permanent open space. Lot 19 is a prime, level home site just steps to the pond. Both lots offer stunning, panoramic vistas, great southern exposure, and beautiful Colorado light all day long. 375 Saddle Ridge Ranch Road SADDLE RIDGE RANCH ESTATES Charming subdivision with horse stable and great access to the Lupine trail at the top of the subdivision. Red, Whetstone, Axtell and Emmons mountains dominate the southern skyline and iconic Mt. Crested Butte towers to the east. The ski resort and the Town of Crested Butte are both about 5 minutes away making Saddle Ridge Ranch the most convenient estate lot community. 110 Whetstone Vista Drive WHETSTONE VISTA Beautiful 2.7 acre site with easy access to Brush Creek Rd., The Club at Crested Butte and all the surrounding trails. Not to mention a 5 minute drive to town. Level building area offering huge views and plenty of sun. TBD County Road 740 Large tract of private land located just past Crested Butte South up Cement Creek Road aka County Road 740. 17.41 acres total. Up and down valley mountain and meadow views. Well and septic required. GCEA power available to boundary line. No HOA, no dues, no covenants. 341 Larkspur Loop LARKSPUR Larkspur is in close proximity to town (2 minute drive or 10 minute bike ride), Skyland Community Golf Course, the ski resort and National Forest. Amenities include two ponds with a walking path around, tennis courts and a playground. Single-track bike/hiking trails are located just minutes from the property. This is truly a wonderful spot to build your dream home in the mountains. 299 Meridian Lake Drive MERIDIAN LAKE PARK Located in Meridian Lake Park and backing up to open space, 299 Meridian Lake Drive boasts truly some of the most incredible mountain views in the area. There is easy access to trails via Washington Gulch Road for both summer and winter recreation. Meridian Lake Park is unique in the sense that, like almost nowhere, the stars at night are absolutely incredible. The towns of Crested Butte and Mt. Crested Butte are each less than a 10-minute drive away. Donâ&#x20AC;&#x2122;t miss this opportunity! TBD Irwin 11th Street The Irwin area offers access to excellent hiking, skiing and hunting terrain. Recreating in this area is not for the faint of heart. This estimated 1.3 acre parcel is adjacent to the National Mining Claim with a documented easement to the property through Copley Lake Rd. The sloped parcel is partially treed and has amazing view from the site. Just off Copley Lake Rd. on the left, the property will be accessed by a short driveway once you build your cabin. Easy access to the National Forest and Lake Irwin. Hunting Unit 55. The Town of Crested Butte The Town of Crested Butte, fondly referred to as "The Gateway to the Elk Mountains," "Colorado's Last Great Ski Town" and "The Wildflower Capital of Colorado" sits at an elevation of 8,885 feet and is located 28 miles north of the City of Gunnison. Founded during the mining boom, Crested Butte has developed a unique community character as many aspects of that era still exist today. Strolling down the quaint streets is like walking back in time as many buildings date to the late 1800's. Crested Butte is now a year-round vacation destination and playground for people of all ages and interests, with endless opportunities ranging from snow sports to hikes among wildflowers, river running to world-class mountain biking, and numerous festivals. The town also boasts fantastic restaurants, art galleries, and shops. Crested Butte hosts numerous special events and festivities such as the Wildflower Festival, the Crested Butte Arts Fair and the Crested Butte Summer Music Festival. As one of only 21 Creative Districts throughout Colorado, youâ&#x20AC;&#x2122;ll find creative minds of every type: metal-workers, photographers, street-side painters, and writers. As you pass friendly locals dressed in costumes simply because it's a Thursday, it doesn't take long to see why this special town is like no other. 512 Journeys End Road HEIGHTS AT CRESTED BUTTE In Crested Butte we call this edge of town "the Bench". The property offers expansive views from Mount Emmons 180 degrees to the Butte. The botanical garden feeling as you drive up to the house is stunning. Beautiful perennials are gracefully and thoughtfully planted for the best possible exposure. The main entrance brings you to an atrium. As you walk a few steps further you're in the open kitchen dining area with a kitchen most cooks would kill to have! The living area steps down to give you incredible views of the surrounding mountain ranges and town. A fireplace enhances one corner of the living room for a cozy winter night or reading spot. Going upstairs you'll find the master bedroom suite with the same majestic views as offered in the living room. There are an additional 3 bedrooms and 2 baths as well. State of the art construction techniques and solar assisted in-floor heat create a warm, comfortable living space with low utility bills. The lower level completes the home with media room/exercise area, full bath and storage. An additional bedroom/workshop rounds things off. The detached heated two car garage has a lovely one bedroom caretakers apartment above it. There is an additional heated garage attached to the house. Summer or winter recreation trails are literally just outside the door. 215 Teocalli Avenue Located in the peaceful West End of Crested Butte, 215 Teocalli is a masterful mountain modern renovation by Carolina Alling of ID Design. The original home contained oversized windows that provide a treehouse effect in the summer and views of Red Lady, Gothic and Mt. Crested Butte in the winter. Rebuilt from the studs, the home enjoys many refinements including wide plank hardwood flooring throughout, American Clay walls, designer lighting, forged iron handrails, fireplace and stove hood, rustic beam treatments, custom interior doors and gorgeous cabinetry, vanities and tile work. The kitchen, outfitted in marble and honed granite tops, features a Wolf six-burner range and eye-catching tile and hardware. The master suite, located on the main level of the home, offers south facing windows and a well appointed bath with double vanities, custom tile work, a steam shower and a deep soak tub. Other property highlights include a lower level bonus room that could easily double as a 5th bedroom and a top level bedroom with a full bath. Outside, mature trees, landscaping and a paved driveway to the attached oversized garage and shop space complete this perfect package. 214 Gothic Avenue This 4 bedroom/ 4.5 bathroom custom home with a 1 bedroom accessory apartment over a 2 car garage is a fantastic opportunity to own on the coveted upper west end of town. The first floor will have a laundry room, master bedroom with views of Mt. Crested Butte and a second ensuite bedroom plus powder room. The second floor will offer fantastic views of Mt. Crested Butte and Red Lady bowl on Mt. Emmons from the living room, dining room and kitchen. Enjoy your morning coffee and afternoon cocktails from your second story south facing deck. The basement provides two additional ensuite bedrooms and the much desired extra family room plus a storage room for all your fun gear! The budget for this home has every detail in mind for top of the line finishes including reclaimed solid oak floors, custom cabinetry, solid granite throughout and amazing ironwork. Create your own outdoor oasis with trees, shrubs, and of course wildflowers since we are the Wildflower Capital of Colorado. Soils tests and one tap fee are included in this offering. Perks of townie living at 214 Gothic include a quiet location just a short stroll over the footbridge at Totem Pole Park for coffee, shopping, the bus stop to ski area, or dinner with friends. Access the lower loop and entire Slate River valley for endless miles of Nordic trails, mountain biking and hiking just steps from your front door. This project offers BOZAR approved Dan Murphy Architect plans just waiting to be enhanced with your style. This rare opportunity in the best little ski town around can be yours! 4 Treasury Hill Road A primo location in one of Crested Butte’s sweetest neighborhoods, 4 Treasury Hill Road sits on a peaceful .22 acre parcel, enjoys an elevated perch, excellent solar gain in the winter and beautiful mature trees all around. The view of Mt Crested Butte towering above the valley floor is pretty cool too. Interior highlights include an open plan upstairs with vaulted ceilings above the kitchen, living and dining areas and a newly added 3rd floor bedroom suite with bath. The 2,438 SF, four bedroom home is big but this property can be expanded with ample FAR allowance remaining. The 2-car, 531 SF heated garage is big enough for the vehicles, bikes and skis! Treasury Hill is a special neighborhood with built-in solitude, no traffic and easy access to everything you care about. It’s just 3 blocks to Elk Avenue dining, shopping and nightlife and about a 100 feet to some Crested Butte’s world class hiking, biking and nordic ski trails. A central yet private location near Coal Creek, quiet cul-de-sac living, all day Colorado sunshine and beautifully treed and landscaped outdoor spaces, 325 Gothic epitomizes the Crested Butte lifestyle. Walk two blocks south and enjoy the vibrance of Elk Avenue, go the other direction and depending on the season you are nordic skiing, biking or hiking the spectacular Lower Loop trail in a few minutes. On the outside the home's Victorian influenced charm masks an interior design of craftsman elegance. Interior features include hickory hardwood and tile flooring, a recently updated kitchen and master suite, a dining room with commanding views of the ski resort and Mt. Crested Butte and a comfy living room with attached hot tub deck! The covered porches, flagstone patio and tranquil waterfall feature round out this special offering. Located in the highly desirable west end of historic Crested Butte, 205 Teocalli offers a refreshing floor plan opportunity with the living areas, kitchen and master suite all on the main floor and three guest rooms and two baths upstairs. Interior highlights include a well equipped kitchen, beautiful hardwood flooring throughout the main level, designer lighting and a gorgeous rock fireplace and custom cabinetry in the living room. Sitting on the north side of a quiet street, the property enjoys sweet southern light and views of Gibson's Ridge. Out back, a huge deck, privacy fence and big mature pine trees create seclusion and a great place to hang out and bar-b-que after a day on the trails. There is also a detached 2-car heated 587 SF garage with a finished space above and a 1/2 bath. The Historic District of Crested Butte at it's very best. Superior corner location situated on 3 wonderfully landscaped lots with an antique vintage Victorian metal fence in the front with appealing gates and a six foot decorative wooden fence which surrounds and encloses the entire back yard. It was owned by a prestigious builder in town, who recently made substantial improvements, upgraded the plumbing and remodeled the kitchen, downstairs full bath with Jacuzzi tub. The kitchen has a great dine in cubby, new double oven/range and abundant storage, middle room is the dining area and the front of the house is the quaint living room. The deed restricted "apartment" has its own two bedrooms and full bath. Located in the coveted west end of Town on the 0 block of quiet Teocalli Avenue, this home satisfies on all levels. The Lower Loop trail system access is nearby and Elk Avenue dining, shops galleries, and the free skier shuttle bus are just two blocks away. The quality of the location is complimented by the homeâ&#x20AC;&#x2122;s beautiful interior design and use of refined finishes and furnishings. Double thick granite counter tops anchor a gorgeous custom kitchen outfitted with a Thermador dual-fuel range and Jenn-Air stainless steel appliances wrapped by custom cabinetry and eye catching tile backsplash. The open floor plan upstairs features a spacious living room, vaulted ceilings, hardwood floors and easy access to the large deck dominated by Mt Crested Butte views. Other highlights include a standing-seam metal roof, highly efficient hydronic baseboard gas heat, a flagstone walkway to a covered, south-facing front porch and a yard full of mature trees, lawn and landscaping. 124 Sopris Avenue Nestled into an alley in the West Sopris area, this little gem offers much for it’s small size! Listed as a 2 bedroom/1 bath, there is an additional second floor loft space that has been used as a bedroom and study area, a large home office, or a spot for movies and popcorn! The house is an old miner’s cabin that was remodeled in 2007 with an interior eye toward contemporary and an exterior eye toward historic preservation. The remodel was achieved by B2 Builders, one of the county’s most active green construction companies. Just a moment’s walk to the heart of Crested Butte, the property is also on the ski-bus route. 730 Butte Avenue Great corner location with wetlands across the street protecting your views. Cutest little house around! Main floor living, dining and kitchen. Kitchen has an arched ceiling with Italian plaster. Hand painted wall paper on stairwell walls. Shoe friendly painted plywood floor. Garage is attached and could easily be made into more home with radiant in-floor heat! Solar powered reversible air movement system, ADA accessible through the garage. A well designed “lock it and leave it” home with handy water main shut off, redundant gas heaters (electric back up), programmable thermostats. 111 Elk Avenue, Unit 3 Central & convenient location in downtown Crested Butte. This 3-bedroom condo lives big at just over 1,800 SF. The property enjoys a private, south-facing deck, big windows, views and great Colorado light. The Zinc Building comprises commercial office and retail spaces on the 1st and 2nd floor with this residential unit taking up the entire 3rd floor of the building. TBD Journeys End Road Arguably one of the very finest homesite offerings in our valley, Lot 5 at the Heights at Crested Butte enjoys an elevated perch just above the south end of town and absolutely spectacular, panoramic views of the Paradise Divide, Red Lady, Mt. Crested Butte and the beautiful Elk mountains. You can easily walk or pedal down into town from this spot. The groomed nordic trails and the Green Lake hiking trail are located just across the street. The lot has been surveyed and the pins are marked. 927 Belleview Avenue Adjacent to the permanent open spaces of the Verzuh Ranch at the eastern edge of Town, this .26 acre homesite features commanding & forever protected vistas of the Paradise Divide, Gothic Mountain and iconic Mt. Crested Butte. The oversized parcel gives you the most build-able square footage allowance and design flexibility per Town of Crested Butte guidelines. Belleview Avenue ends in a cul-de-sac keeping things quiet and peaceful. This location receives great solar. 7 Aspen Hill Road A premier address and stunning location in Crested Butte, 7 Aspen Hill Road is perched above the historic west end of town. Featuring commanding views of the mountains and the town below, this homesite is the perfect setting for your family's new mountain home. It is just a 5 minute walk to Elk Avenue dining, shopping and nightlife and Woods Walk and the Lower Loop ski and hiking trail system is even closer! The property borders the open spaces of the 71 acre Trappers Crossing parcel to the south and the 1.6 acre open space of the Treasury Hill Association to the east. An amazing set of architected home plans and a site plan are available for review. 923 Belleview Avenue Bordering the permanent open spaces of the Verzuh Ranch at the edge of Town, this .26 acre homesite enjoys stunning & forever protected views to the Paradise Divide, Gothic Mountain, White & Whiterock Mountains and Mt. Crested Butte. The oversized parcel gives you the most build-able square footage and design flexibility per Town of Crested Butte guidelines. The street ends in a cul-de-sac keeping things quiet and peaceful. This location receives good solar. The parcel is flat, keeping the earthwork and foundation costs low. 113 Fourth Street The perfect level lot in the town of Crested Butte, located just two blocks away from Elk Ave. Build your mountain home or get a way. Close enough to walk to everything, but far enough away to have some space. A spectacular view of Mt CB from the front yard and situated on a quiet street. 214 Gothic Avenue This fabulous vacant lot in the coveted upper west end of Crested Butte is ready for you to build your dream home with BOZAR approved Dan Murphy Architect plans, including soils testing and one tap fee. This 4 bedroom/ 4.5 bathrooms designed home with a 1 bedroom accessory apartment over 2 car garage is a fantastic opportunity to get in on the sacred part of town. Walk over the foot bridge at Totem Pole park one block from your home for coffee, shopping, bus stop to ski area and dinner with friends. Access the lower loop and entire Slate River valley for nordic trails, mountain biking and hiking just minutes from your front door. A quiet quaint location in the best little ski town around. 39 Whetstone Road The Crested Butte Retreat, a special opportunity in the beautiful ski and summer resort of Crested Butte Colorado, is located on the flanks of stunning Mt. Crested Butte and just a short walk to the ski slopes and Crested Butte Mountain Resort’s evolving base area. Bask in south-facing sunshine from this elevated parcel as you take in the forever protected panoramic vistas of the surrounding peaks. The 11,323 square foot luxury ski lodge was completely remodeled in 2005. Highlights include 11 total bedrooms, including four master suites with their own outdoor private hot tubs, and a large common area that includes a living room, dining room, kitchen and lounge. Enjoy the sun, the stars and the high alpine climate from any of the property’s numerous decks and outdoor spaces. Other features include a spa and massage room, indoor and outdoor Finnish sauna and a fully equipped gym and fitness room. Additionally, there is 1 bedroom owners apartment and an efficiency apartment located over the 3-car garage. Currently set up for special events, a corporate retreat or a very special legacy vacation home for the entire family, the Retreat represents the absolute best Crested Butte has to offer! Offering includes the property’s extensive furnishings and world class art and antique collection. 14 Hunter Hill Road WESTWALL LODGE Welcome to WestWall Lodge, a premier ski-in, ski-out development unmatched by any other in and around the Crested Butte area. Completed in 2006, WestWall Lodge fulfills a niche that simply hasnâ&#x20AC;&#x2122;t existed in our community by offering luxurious slope-side living combined with extensive amenities that the most discerning owner and their guests can enjoy. With a full service property management company, a heated garage and storage area, a library/meeting room, fitness facility, pool, hot tub, sauna, a bar/restaurant, and a comfortable lobby, WestWall guests and owners can arrive, immediately relax, and appreciate easy living at its finest. The units within the development vary in size, and rarely do you see the larger properties come available. But unit C201 is the exception. Facing slope-side, this spacious unit enjoys direct ski access to/from the WestWall lift and snow conditions can be confirmed by simply peaking out the window. The open concept kitchen, living, and dining room provides the ideal space for entertaining, and the beautiful stone fireplace offers warmth after a long day of skiing or hiking out your front door. The large bedrooms each have en-suite bathrooms and provide ample room for friends and family, and the private deck overlooks the courtyard and ski area. Unit C201 is offered unfurnished, enabling a Buyer to put their own stamp on the home by furnishing it to their personal taste. And with very little use throughout the years, the home lives and feels brand new. Unit C201 has never been in a rental pool; however, 4 bedroom units are of high demand at WestWall Lodge and the rental potential is vast. The opportunities are endless at WestWall Lodge, and unit C201 is a spectacular offering rarely available in our area. Come take a look today! 14 Appaloosa WILDHORSE AT PROSPECT 14 Appaloosa Road enjoys an elevated perch and faces south over the open space toward the ski slopes. The location enjoys Colorado sunshine all day long and captivating mountain and ski run views. Under construction now, inquire to learn more about this latest mountain modern home from Wildhorse Homes. The interior layout puts the master bedroom suite on the main level with the kitchen, dining and living areas. The family room is situated upstairs and there are three bedroom suites on the lower level. Every home from Wildhorse Homes features exquisite interior designs, and high-caliber craftsmanship and materials. Each home comprises over 4,000 total square feet, including four bedroom suites with private bathrooms, a heated 2-car garage, and plenty of room for family and entertaining. From the oversized decks, enjoy the views to the south of Mt. Crested Butte and to the north overlooking the East River Valley. The combination of a great floor plan, high end finishes, and stunning views make Wildhorse at Prospect the place to be in Crested Butte. Photos are from 16 Appaloosa. 620 Gothic Road | Unit 211 The quiet, sunny side of Lodge at Mountaineer Square, Unit 211 features a full bedroom suite that locks off from the main residence creating flexible usage in the rental market. Interior highlights include knotty alder cabinets and granite tops in the kitchen, a mix of tile floors and new carpeting throughout and a gas fireplace in the living and dining area. The 1,800 SF, 3-bed, 3-bath condo is offered furnished and ready to go for the ski season. The condo enjoys sitting deck views to the south of the high peaks and the historic town of Crested Butte. At the Lodge, its just a short walk to the ski slopes, restaurants, shops and the free skier shuttle stop to town. Owner amenities include the hot tub, sauna, swimming pool, fitness center plus a heated parking garage. 24 Whetstone Road Four bedroom home located in a quiet portion of Whetstone Road situated on a 2/3 acre lot elevated over the paved street. This attractive residence provides great views from the living room wall of windows to Oh-be-joyful, Whetstone Mt. and over the lights of Mt. Crested Butte. Includes private decks from 2 of the bedrooms, 2 spacious master bedrooms, 3 bathrooms, 10’ LR ceilings and ski gear room. The ski shuttle is 2 blocks away. 750 Gothic Road Welcome to 750 Gothic Rd.- Mt. Crested Butte’s first single family home! This spacious property sits on over a half acre and is literally steps to the base area. Offering 4 large bedrooms, 3 full baths, and an attached 2-car garage, this home is privately situated in the aspen trees and has vaulted ceilings, lots of natural light, a spacious kitchen, and unobstructed mountain views from the large deck. The potential that lies within this home is undeniable and you’ll fall in love with its unique character and incredible location! 721 Gothic Road | Unit 5 OUTRUN One of the newest and finest condo complexes in Mt. Crested Butte, the Poplar Building at Outrun Condos is an absolute winner. Unit 5 enjoys forever protected views of the mountains from the large picture windows and spacious decks! This corner unit has natural light on three sides! Highlights include an open floor plan accented by hardwood floors, a rock fireplace and a well equipped kitchen in granite and tile, knotty alder cabinets and stainless steel appliances. Other features include radiant heat floors, a 1-car garage, an elevator and a private master suite deck with views to the west! From here, itâ&#x20AC;&#x2122;s a mellow walk to the ski resort base area. You can also jump the free skier shuttle at the nearby stop on Marcellina. Outrun amenities include the private tennis court and hot tubs. 11 Snowmass Road | Unit 334 PLAZA AT WOOD CREEK Ideal Ski Condo! Located just steps away from the lifts to allow for easy access to the ski area. This spacious condo has an open floor plan with granite counter tops and stainless steel appliances. Enjoy sunsets from the deck and the majestic views of the surrounding mountains. This unit comes fully furnished with a fabulous furniture package. 6 Emmons Road | 251 & 253 THE GRAND LODGE Amenities include comfortable lobby with wood burning fireplace, indoor/outdoor heated pool and hot tub, patio with fire pit, free parking, business center, wi-fi in rooms, fitness center, laundry facilities, complimentary slope-side ski storage, on-site restaurant and bar, spa and gift shop. These connecting units offer quick access to the winter slopes/summer trails of Crested Butte Mountain Resort and free shuttle service to town. BEAR CROSSING Mt. Crested Butte ski resort development land for sale. Located within steps of the West Wall Lodge ski lift and Crested Butte Mountain Resort ski slopes, Bear Crossing comes complete with architectural drawings designed by Oz Architects for 27 luxury residences and subterranean parking. The development has a site area of approximately 71,918 square feet and approximately 43,145 of net sell-able square footage. Seller would also entertain a joint venture in building this fully entitled, four-story condominium project offering large two and three bedroom condominium units with expansive outdoor terraces. This luxury project is a rare opportunity to secure and develop one of the last remaining high-density multi-family zoned parcels at the resort. 12 Crystal Road Unique residential development opportunity walking distance to ski area. Plans on file complete with soils and engineering report for three 1600 sq.ft. townhomes with garage, unobstructed views of the Elks and the Slate River valley on the bus route. 10 Peakview Drive The Overlook Subdivision on the western flanks of Mount Crested Butte was designed to capture the long hours of sunlit warmth and an enchanting west-facing view of historic downtown Crested Butte. Enjoy the tranquil sounds of moving water from Washington Gulch. The perfect place to build a luxury ski cabin with low property taxes and HOA dues. 55 Cinnamon Mountain Drive This is a view lot! Overlooking the ski resort and surrounding mountain ranges. A large site with a gradual slope makes this is a great location to build your mountain getaway! 23 Whetstone Road Wonderful exposure to the East, South and West with exceptional views of the "BUTTE" and town center. The lot is a grassy knoll that should be easy to build on yet giving quite protected views all around it. The photos don't do it justice they are 360 Degrees of open views! 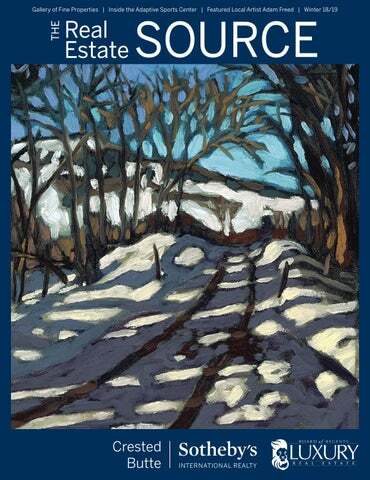 CB South Lots Build your dream home in one of these beautiful Crested Butte South lots. Commanding views of Whetstone, Red Mountain, and Cement Mountain, as well as fishing rights and nearby amenities. Just 10 miles to world class skiing at Crested Butte Mountain Resort. 21 Neville Way Enjoy this beautiful white cedar log home situated in its own private Aspen grove on 1.51 acres offering the privacy that one desires in a mountain home. Incredible upgrades have been done with new reclaimed hardwood floors, rock fireplace that circulates warm air throughout the home, new cedar deck, and a newly stained and painted exterior. Other features include Silestone kitchen counter-tops, open living, kitchen, dining floor plan, main level master bedroom and bath and an artistâ&#x20AC;&#x2122;s studio/den or bedroom. Red Mountain Park, hiking, biking and cross-country skiing are just a short distance away. The incredible mountain views make this the perfect place to call home. 334 Anderson Drive Wow! What a location on the hill above Crested Butte South. The commanding, panoramic views from 334 Anderson are forever protected. Red Mountain and Whetstone fill the southern skyline and you can see all the way to Red Lady from this great spot. The south facing home basks in Colorado sunshine all day bringing warmth into all three levels of this home. Finished in 2017, the property enjoys a full lower level walk out with the 3rd bedroom, a bathroom and a second living area complete with a wet bar and plenty of space for entertaining. Upstairs, the open floor plan features a well equipped kitchen, dedicated dining and living areas, a pantry, a full bath and huge bedroom. The top floor enjoys a loft space, another big bedroom and a nicely appointed bathroom. Outside, there is a storage shed and the parcel has a great spot for a future garage. Titled the Base Camp of the Rocky Mountains, Gunnison offers access to a variety of outdoor recreation activities without sacrificing the conveniences of a thriving community. Gunnison still retains and honors its historic tradition as a ranching town with annual community events including Cattlemen's Days and the Tough Enough to Wear Pink rodeo. It is also home to Western State Colorado University, a small state university offering a full liberal arts curriculum paired with practical career preparation. Blue Mesa Reservoir, the largest lake in Colorado, is 15 minutes away and offers sailing, power boating, fishing, water skiing, and windsurfing. The Gunnison River flows through town providing multiple access points for rafting, white water kayaking, and paddle boarding. Also along the river is the Dos Rios Golf Club offering a full 18 hole course and clubhouse with pro shop. Just outside of town is Hartman Rocks Recreation Area comprised of over 8,000 acres of public land. With miles of trails and roads maintained by the BLM and local Gunnison recreation groups, Hartmanâ&#x20AC;&#x2122;s is one of western Coloradoâ&#x20AC;&#x2122;s best kept secrets for desert mountain biking, hiking, motorcycling, rock climbing, horseback riding, trail running, and Nordic skiing. Almont is home to the headwaters of the Gunnison River. Situated at the confluence of the Taylor River and the East River, Almont is a destination for boaters and fishermen. Those looking for land based adventures can head up the Taylor River Canyon to access biking and ATV trails as well as horseback riding and rock climbing. The possibilities are endless in the surrounding Gunnison National Forest lands and Fossil Ridge Wilderness and Recreation Areas. bank. This outstanding residence designed by architect Tim Montgomery is situated on one acre in the private Homestead Subdivision with views from the master bedroom to the Taylor River, from the lofty living room to the East River and from the dining and kitchen to the Gunnison River. 340 Tomichi Trail DOS RIOS A rare and spectacular offering of new construction with Douglas Fir Post and Beam construction, directly on the 17th hole of Dos Rios Country Club. The soaring ceilings and floor to ceiling windows offer incredible natural light and views from every room. The large double French sliding doors access a wrap-around outdoor deck to enjoy during those sunny afternoons. Located within a very private setting, yet offering easy access to all town amenities. Golf, Fish, and Cross-Country Ski from your front door. 410 Rim Road ARROWHEAD This home features a sun room, game room, media room and an upstairs office in the loft and has been well maintained and continually upgraded and improved as needed. The activities available to family and guests include hunting, fishing, hiking, biking, motorcycling, 4-wheel driving, snowshoeing, cross-country skiing and snowmobiling. This house has a pull through garage feature so your snowmobiles can be serviced or stored under the side of the home for your convenience. RIVERWALK ESTATES Riverwalk Estates is an exclusive development of more than 100 acres, nestled along the winding stretches of the Gunnison River, a fly-fishing, and recreation paradise. Amenities include fishing access on the Gunnison River, a network of private walking trails, fishing in stocked ponds, ice skating and a cabin for your guests. Riverwalk Estates is centrally located in the Gunnison Country; only a seven-minute drive to downtown Gunnison and a twenty-five-minute drive to Crested Butte. Whether it is the world class skiing, fishing, biking, hiking or rafting, you can find a lifetimeâ&#x20AC;&#x2122;s worth of outdoor activities to do as a family all year long. For every sale, the seller donates $500 to a local non-profit. Riverwalk Estates is a retreat for the discerning home owner. Visit GunnisonRiverwalk.com for further information. 129 Elk Avenue FOREST QUEEN Located in the heart of downtown Crested Butte, with Coal Creek running alongside, sits the Historic Forest Queen Building. Built in 1882, being one of the first hotels in town, The Forest Queen has provided the base for many memories and employment for people past and present. The first floor houses a cozy and welcoming fine dining restaurant and bar. On the second floor, there are seven individually decorated Victorian rooms. Right across the street from the free town shuttle, with direct access to the ski area, as well as neighboring bars and restaurants, this location has always been in the center of it all. Whether your interest is commercial space, residential living, or multi-use, this property encompasses all possibilities. 273 Gillaspey Avenue The perfect set up with an office and 3/4 bath off from a large, insulated, heated and finished shop space with two garage doors for complete drive thru. There are built in shelving on most walls and it is completely ready for immediate use. The two apartments are nicely appointed with wood floors in the great room and carpeted bedrooms. The kitchens have all new stainless appliances and each unit has its own washer and dryer. They face south/east and have lots of sunlight and air flow. 214 Sixth Street, Unit 8 Enjoy this second floor 538 square foot office space located in the Ore Bucket Building in downtown Crested Butte. The location is just a 1/2 block away from the 4-way stop and right by the bus stop. The HOA is well established with a healthy reserve. HOA dues include trash, electric, water, sewer, snow removal, landscaping and cleaning of the common areas and bathrooms. The unit is currently leased to a professional office tenant. This is a great opportunity for investment. 517 Second Street Great local business for sale. Family style, fried chicken restaurant established in 1984, a staple of the community. Brand new $13,000 POSitouch computer system and numerous pieces of equipment. TBD Hwy 135 This commercial 2.62 acre parcel houses a radio station’s equipment in the brick shed and the antenna on the grounds. This is generating $550.00 in rental income per month at this time. There are a few cows on the parcel as well. 47 Haverly Street Crested Butte area’s best value in a commercial lot! It’s a steep lot but could be used as a multi level structure with residential on top! Check it out for your commercial future! We are Farm & Ranch specialists with a network of 880 full-service, global offices. We have more local boots on the ground than any other Farm and Ranch brokerage. 800 Eagle Meadow Drive EAGLE RIDGE RANCH Situated in one of Colorado’s most stunning landscapes, The D-Bar Ranch is the ultimate legacy luxury estate. With commanding views of Carbon Peak, Whetstone and Red Mountain, the ranch sits within walking distance of Ohio Creek. The D-Bar Ranch is part of the largest conservation easement in Gunnison County - Eagle Ridge Ranch. There are 5,800 acres under ranch management: the 4,900 acres of the ranch itself, 600 acres under federal permit and 300 acres under long-term state lease. Eagle Ridge Ranch includes two and a half miles of private access on Ohio Creek, one of the best fly-fishing streams in Colorado as well as multiple ponds and more than 2,600 acres of wilderness for hunting, off-roading, hiking, mountain biking, cross-country skiing and much more. Other ranch amenities include a private equestrian center, and two comfortable wilderness cabins. The ranch is managed with three priorities: profitable agriculture, conservation and enhancement of wildlife, and homeowners’ recreation. Homeowners’ committees work with experts and local conservation authorities to ensure good environmental management. As a result, homeowners are able to enjoy some of the most beautiful country in all of the West. Featuring majestic views of the Ohio Creek Valley, The D-Bar Ranch offers an exquisite 7,100 square foot residence including a fully furnished four bedroom, four full and one-half bath main house, a fully furnished three bedroom, three full and one-half bath guest home, three car heated attached garage, and a three-stall heated barn. Designed by distinguished architect Daniel J Murphy, and built by Holbrook and Smith General Contractors, the D-Bar Ranch is a family home built of stone and reclaimed timber that blends mountain ranch style with modern simplicity. The quality and craftsmanship of the hand built trusses, antique timbers and reclaimed wood floors are unparalleled. For those looking for the rarest and very best, the D-Bar Ranch will be a timeless and prized possession for years to come. 590 Red Mountain Road DANNI RANCH Remarkable retreat located on 35 + acres in the exclusive Danni Ranch community. Comprised of 19 home sites, Danni Ranch is a premier community just minutes from the town of Crested Butte, outstanding restaurants, world class skiing and a Robert Trent Jones golf course. Amenities include private access to an enhanced stretch of the East River, a private fishing and recreation pond, equestrian facilities, private access to the Gunnison National Forest and a full time resident ranch manager. The MAIN HOME is a unique, high quality log home built by local craftsman, Scott Noreen. Upon entering the home, one is welcomed with 25 ft vaulted ceilings and expansive views of the valley and snowcapped peaks. The perfect entertainersâ&#x20AC;&#x2122; floor plan includes grand living spaces and incredible decks to enjoy the view and spectacular backyard. The main level includes a great room opening off the gourmet kitchen which is centered around a large sandstone island. The gorgeous master bedroom and a guest suite are also on the main level. Downstairs takes you to another 3 bedrooms, game room, hot tub room and wine cellar. The loft overlooking the great room offers an office space and additional sleeping, bringing the total sleeping capacity to 12+. The GUEST HOUSE is finished with the same highquality craftsmanship as the main house. The wrap around covered decks offer year-round outdoor living complete with a fireplace. The kitchen is the center of the home opening to the family room and dining both with French doors leading to the covered decks. The BARN houses 3 covered stalls with sliding doors and 20 ft runs. There is a fenced lane from the barn leading to the 2 grazing pastures. This estate is the perfect mountain getaway for executives and families alike. 938 Round Mountain Road ROUND MOUNTAIN RANCH A grand ranch in the mountains. Hodges Hideaway is an exceptional property in Gunnison County Colorado that must be seen to be truly appreciated. Only fifteen minutes from the historical resort town of Crested Butte, this 50+acre ranch estate is part of the Round Mountain at Roaring Judy Ranch Subdivision situated near Cottonwood Pass and the Taylor River. The property offers a large three bedroom and manager’s quarters main house built of impeccable quality and finishes, a garage for more than four vehicles, a greenhouse, a horse barn with four indoor stalls and two-bedroom staff’s quarters, storage sheds, stables and arenas with horse friendly fencing. This property is ready for any horse discipline to call its headquarters or any family to call its mountain retreat. Other amenities include hiking and horseback trails among the aspen groves, vast pastures for grazing, and valuable water rights. This ranch provides the perfect setting to enjoy long vacations, plenty of room for entertaining, and many meeting spaces for comfortable corporate retreats. Rare and special, this is one of very few properties built with no expense spared in creating an oasis of luxury, comfort and entertainment – In an ideal mountain setting for both summer and winter recreation, ranch business, or relaxation. 624 Hidden River Road HIDDEN RIVER RANCH Perfection overlooking the East River. A home not only with good design but with thoughtful spaces for views, decks, porches, and outside living. A small stream fills a pond below the home and the owners created an easy path down to the River for fishing or walking. The home is designed for open spaces to share with two floors each having great rooms. The main floor has the master bedroom, great room, 1/2 bath and laundry. Take the back stairs to the upper bedroom and 3/4 bath or use as just a place to get away. The walk out garden level has a great media room, bar and an additional 2 bedrooms. Ready to move in being sold fully furnished, this extraordinary home is walk-in ready for occupancy and ready to enjoy the fabulous Crested Butte lifestyle! 1021 McCormick Ranch Road MCCORMICK RANCH Appearing as an old ranchers homestead with reclaimed barn wood exterior and rusted corrugated steel roof, the rustic exterior masks a refined, understated interior, the latest in green building techniques and materials, and solar arrays for both heat and electrical generation. With systems designed and engineered by REG, 1021 McCormick is the first LEED Gold certified house built on the Western Slope. (2008) The interior walls are coated with American Clay. The trim and doors are solid cherry, custom milled and built by local cabinetmaker David Treadway. David also built the cabinets and custom furniture with cherry and reclaimed lumber. The handrails in the barn and house were handmade by local blacksmith Ben Eaton, of Get Bent Blacksmithing. The floors are 100 year old reclaimed hardwood flooring. Constructed of structural insulated panels (SIPs), the house is extremely well insulated and quiet. The solar water panels collect heat which is stored in a large insulated water tank to provide extra heat when the sun is down. The panels heat the floors of the house and the hot water supply tank. The large electrical solar array generates excess electricity resulting in an annual check from the electric company. An air circulation system (ERV) circulates fresh air throughout the house while retaining heat when the outside temperatures are low. A humidification system adds humidity to the incoming air, creating a nose, throat and skin friendly interior humidity level. Completely remodeled in 2015 to a luxurious spec, this amazing 6,472 SF, six-bedroom ranch property enjoys over 46 acres of fenced land, stunning mountain views, privacy and close proximity to Crested Butte. Highlights include a 10,000 SF indoor riding arena with six stalls, an outdoor, regulation competition riding arena, loafing sheds, a heated dog kennel and a four vehicle garage. The main residence comprises five bedrooms and two living areas and the guest apartment with a private entrance includes a second kitchen, a bedroom and two baths. This is a private ranch sitting within the County so there is no HOA or covenants, a rare thing in our market. Offered at well below replacement cost. 1815 Sioux Road WILDERNESS STREAMS Wilderness Streams is a unique and special community for those who truly treasure the beauty and serenity of the wilderness. Enjoy fishing in the stocked ponds from your back door to hiking to the Castles in the West Elk Wilderness. Year round access allows you to explore in the winter with awesome back country, cross country skiing and snowmobiling. For your home away from home in the woods you will miss nothing here in this custom full log home on 5 acres. Everyone will appreciate the main floor master and living space, four more bedrooms, three full baths and one powder room. No detail was overlooked for the chef with stainless steel appliances, soap stone counter tops, custom cabinetry, bar top kitchen seating and a separate dining room. Cozy up on the couch in the living room with a beautiful dry stack stone fireplace and enjoy captivating the views. The game room with walk out basement, hot tub and two spare rooms gives you and your guests plenty of room to stretch out. For those of you who canâ&#x20AC;&#x2122;t seem to leave work at work, you will have full WiFi connection with a security system and direct TV but we highly recommend getting out and exploring! This home is being sold furnished and will be ready for you to just bring you and your personal touches. abundant forest and meadow land, and generous, priority, water rights, all located 7 miles from Crested Butte, Colorado. The ranch has County maintained roads to the entrance and is located only 1/3 mile to the paved Cement Creek Rd. The property includes a variety of landforms and cover including rugged rock outcroppings, aspen glades, meadow land, evergreen forest, river wetland and river frontage. McCormick Ranch is a gated, ranch subdivision consisting of seven parcels. Situated adjacent to the eastern boundary of the Town of Crested Butte with the Slate River running through the ranch, this location is truly coveted. McCormick Ranch is an easy walking & biking distance to town along a flat, private drive. Horses are allowed, the National Forest is nearby, plus all McCormick Ranch owners receive free lifetime nordic ski passes and have groomed nordic ski track access. and many more upgrades are in the works! sion located roughly halfway between Crested Butte and Gunnison, making it an easy commute to either end of the valley. This gated luxury community offers roads maintained year round by an active homeownerâ&#x20AC;&#x2122;s association. Lot 28 Red Mountain Ranch offers the most spectacular views of Paradise Divide and the Elk mountains to the north and is one of the most sought after. Well and 1,800 ft driveway in place. west part of the property and it has a boundary with the Gunnison National Forest on the south. Located extending to the northeast offers additional National Forest access . Easy access to CB and Gunnison! Lot 33 Castle Drive Beautiful ranch parcel on top of Star Mountain Ranch. The panoramic mountain and valley views are absolutely stunning from Lot 33. You can literally see for miles from the elevated portion of the land. The 46 acre is the biggest parcel in this ranch community and features a mix of elevated, flat and rolling ground, sage brush, meadows and mature Aspen forests. There are plenty of options for a new ranch home design. Think privacy, protected views, solar gain and easy access off Castle Drive. Lot 6 Castle Drive This is arguably the best view lot at Star Mountain Ranch! 6 Castle Drive, located on the flank of iconic Carbon Peak, is 35.4 acres large, features an elevated home site and absolutely incredible and unobstructed views of the majestic Castles, the Anthracites and the beautiful Ohio Creek Valley. Star Mountain Ranch owners enjoy private fishing and hunting on 300+ community acres and excellent access to BLM and National Forest. 19 Star Mountain Drive Lot 19 at Star Mountain Ranch features panoramic mountain and valley views and all day solar gain! The ranch parcel is elevated and provides for a variety of home designs and orientations. At just over 35 acres there is plenty of elbow room, peace and quiet! Star Mountain Ranch is a 1,500 acre ranch development comprising 33 mountain homesites, each ranging from 35 to 40 acres. 375 acres of common ground provide Star Mountain Ranch owners private fishing, horseback riding and elk and deer hunting. 59 Chickasaw Trail Creekside homesite along Pass Creek in quiet Wilderness Streams. This 4.9 acre mostly level site has a fine, open, building site with a great creek bank location and wonderful views. Property includes fishing on 2 creeks and private access to the prized Castle Creek Trail and the Gunnison National Forest. Wilderness Streams is a gated community of attractive cabins in a high-country ranch setting located 25 minutes to Gunnison and, in summer, 25 minutes via Ohio Pass to Crested Butte. 58 | LIVE CRESTED BUTTE! Featured Events of the Winter 18/19 Santa Ski and Crawl December 15: It doesnâ&#x20AC;&#x2122;t matter if you ski, snowboard or snowblade, all Santas are welcome! Help break the World Record for the most number of skiers, boarders, and bladers in full Santa costumes. New Year's Even Torchlight Parade and Fireworks December 31: Our beloved Crested Butte Ski Instructors form the famous Crested Butte torchlight parade down Mt. Crested Butte beginning a night of fireworks, music, and fun! Music High Music Festival January 16-19: Enjoy a diverse lineup of performers with the most buzzed about, up-and-coming talent for an eclectic mix of mile-high performances. Visit mountainhighmusicfest.com for more information. Fat Bike World Championships January 23-27: Fourth annual event, featuring fat bike venues, demos, discounted lift tickets, refreshments, prizes, giveaways, and live music! Visit cbchamber.com/events/fat-bike/ for more information. Alley Loop February 2: One of the most iconic events in Crested Butte, the Alley Loop features hundreds of Nordic skiers winding their way through downtown CB's alleys, over bridges, and past local parties before finding the pristine Nordic trails just outside of town. Costumes are all but required, and the weirder the better!! Visit cbnordic.org/events for more information. Mardi Gras Parade March 5: Join us on Elk Avenue in downtown Crested Butte for a rockin' good time. In typical CB fashion, costumes are encouraged! Al Johnson Telemark Race March 24: Another Crested Butte gem that is not to be missed! Costumes strongly encouraged as competitors first climb, then descend the steeps. Experience is not necessary, only a great attitude. Prizes awarded for best times, best costumes, and best fall. Visit cbavalanchecenter.org for more information. The GORE-TEX Grand Traverse March 29-30: Partially based on the historical mail routes connecting Crested Butte and Aspen in the 1880's, the Grand Traverse boasts hundreds of racers making their way through the remote Elk Mountains for this grueling 24hr race. See the epic midnight send off at the base area! Visit TheGrandTraverse.org for more information. CRAFTED Tasting Event March 2: Colorado Crafted is the best aprĂ¨s scene of the year! Featuring delicious libations and tasty treats with live music and great company in a mountain setting. Please visit cbchamber.com/events/crafted for more information and to purchase tickets. Closing Weekend April 5-7: End of Ski Season festivities include a free spring concert, Ski Town Breakdown, the ever entertaining Pond Skim, and the all-day party on closing day. Join locals and visitors alike while we party in style - and costumes - to celebrate another successful winter season.